Significance : It occupies one of the highest points in the Sahyadris. Purandhar Fort situated 1.5 km west of Sasvad or about 40 km south of Pune via NH4, is a hill fort known for its unique location. It occupies one of the highest points in the Sahyadris, the summit rising 1475 m above sea level. The mountain on which the fort is constructed was known as the Indraneel Parvat. As per Hindu mythology, this mountain was created when Lord Hanuman was carrying the Dronagiri mountain range, a portion of land slipped from the hands of him. The history of Purandar fort goes back to 13th century. 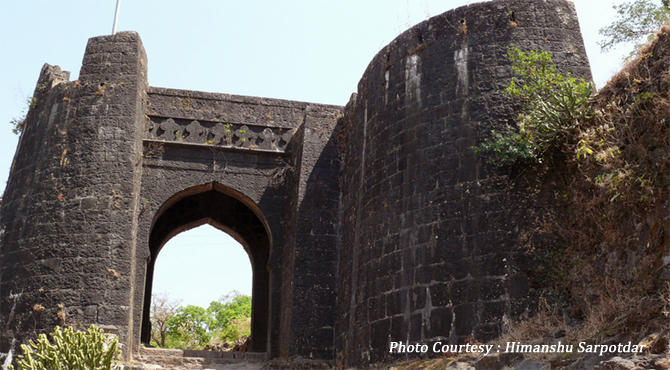 It was fortified by the first Bahamani king Hasan Gangu in the year 1350 after he gained control over Maharashtra. The fort was remaining in Bahamani rulers hands untill 1486. The fort then fell into the hands of Ahmad, the founder of the Nizam Shahi Kingdom for a long spell of over hundred years. In 1596 AD, the fort was given as a Jagir of Maloji Bhosale, grand father of Shivaji. In 1646, Shivaji established control in the fort. In 1665 AD, Purandar was besieged by Mughal forces under the leadership of Mirza Raja Jai Singh and Dillir Khan after an intense battle with Murar Baji Prabhu. Murar Baji Prabhu lost his life in the struggle to retain the fort. The treaty of Purandar was signed after this epic battle in which Shivaji agreed to surrender 23 of his forts to the powerful Mughal Empire. However, Shivaji, recaptured the fort from the Mughals only five years later in 1670. Shivaji spent prolonged periods of time here. Sambhaji, Shivaji's eldest son and successor was born at this fort. Later in 1818, Purandar was occupied by the British and they used it as a sanatorium and detention camp. During the Second World War, the British kept here the German Prisoners. One of the highest forts in Maharashtra., it has two levels : the upper or Ballekilla with precipitous side all around and the lower part or Machi about 300 meters is relatively plain. The northern end of the machi houses a number of new and old monuments which includes the 'Dilli Darwaza' at the eastern extremity of the fort. Machi also compressing the cantonment area of the fortification. The north facing darwaza is flanked by two lions on either side. A narrow path from here will lead to Kandakada, which boasts a huge rock located in the east. From here there are fine views of Vajragad, the fortified lower hill immediately to the east and the Bhima valley below. A set of stairs that start from this point lead directly to the upper level of the fort via Ganesh Darwaza. This winding path takes to the highest part of the fort . A small Mahadev Shrine also known as the Kedareshwar temple crowns this area. One can see another defensive entrance to the fort immediately below. The Rameshwar temple, Purandar machi, Bhairav Khind and Padmavati Lake are some other attractions. This fort also offers rock climbing and trekking. Trekking up Purandar is not very difficult because the climb is not very steep. Once on the top the place provides a panoramic view of the surrounding areas. It takes about three and a half hours to get to the fort from the base village which is Narayanpur and about 45 minutes from Purandeshwar mandir.